Ever wonder how many gardeners seem to have a continuous flow of blooms all throughout the growing season? Many of us employ a technique called “deadheading”. No, it does not include riding around in an old VW bus chasing some rock bank around. 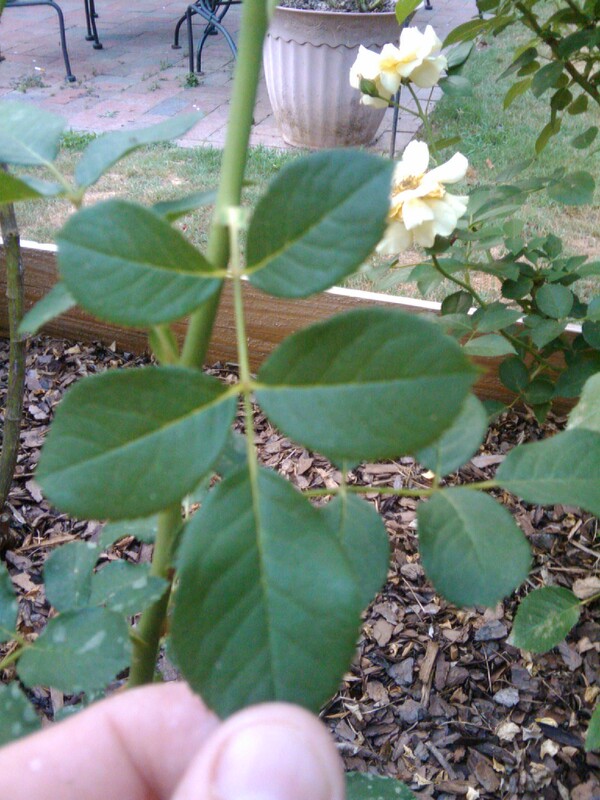 It is a method is lightly pruning your repeat blooming roses. Shrub RosesThis technique encourages new growth and loads of new blooms. It is from this point down that you want to deadhead. Please note that you will never get a new stem any larger from the one you are cutting from, so you want to deadhead at least at the 5-leafset point to ensure a strong rebloom. I try to move down the stem far enough so I cut at a point where the stem is about the circumference of a #2 pencil. 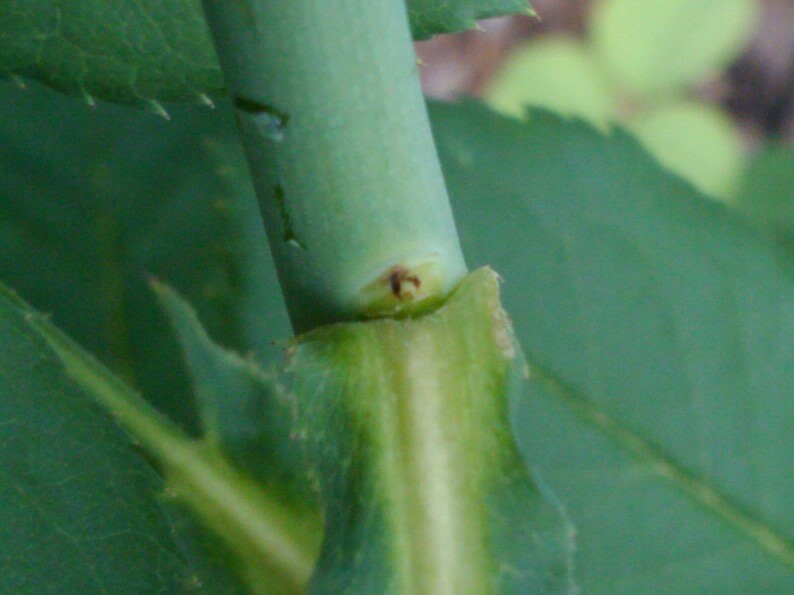 You want to keep the inside of your rose-bush as open as possible to promote good air circulation, so when you cut do so from an outward facing leaflet. Notice the dot at the joining point of the leaflet and the stem? That is called a bud-eye. It will be the point from which a new stem will grow. Keeping your rose beds free of cuttings and fallen leaves and blooms will help keep disease to a minimum. As mentioned earlier, I use a trash can lid to collect my cuttings. I filled this lid up in about 15 minutes. 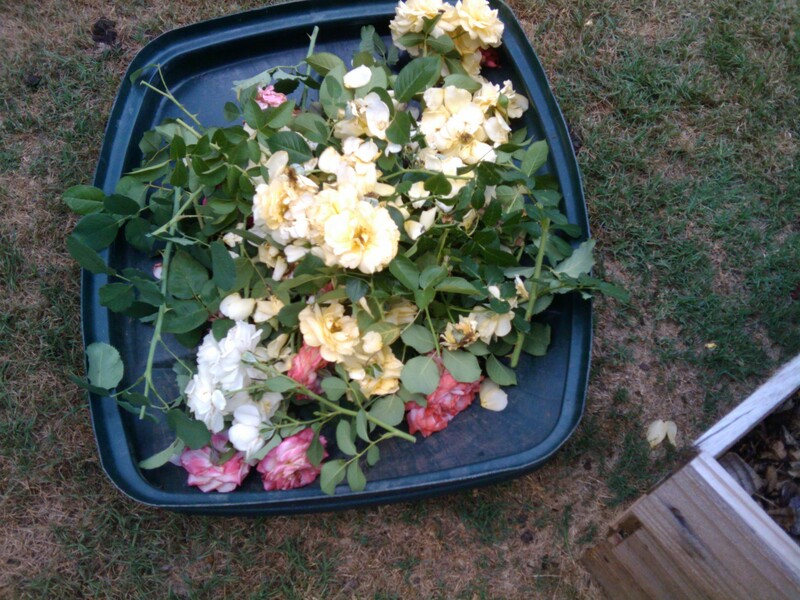 Once you get the hang of basic deadheading, you can deadhead about 20 rose bushes in 10 minutes or so. Following this technique really will inrease the number of rose you see during the growing season. Enjoy your new blooms! This is excellent information from the expert! My pleasure, Susan. Were you able to deadhead some of your neighbors roses? That’s a gorgeous photo of Don Juan. My roses are doing terrible this year. It’s really sad. Thanks for the excellent detailed pictures – they helped me know where to cut. You got it right, Redneck! Keep up the great blog. Terrific tips! I will definitely put these into practice!! Thanks! I did not know this. I only cut of the petalnobs. So glad you discovered my blog and hope you enjoy following my Greenbenchramblings. Excellent writing and photos. As experienced rosarians, we sometimes forget that everyone does not know this. Thank you for the tips – I will have to be brave and deadhead as you suggest (rather than just pinching off the flower head). i rip them off with my bare hands. I guess i shouldn’t be doing that! Love this post. I spent all day Saturday working in the garden and deadheading. Your idea of using the trash can lid to accumulate the waste is so clever. Thank you for liking my blog post on yellow roses today. It is much appreciated. Come back again. I post on flowers and roses quite often. Have a wonderful week. This is well done. What surprises me is that I would never have considered cutting flowers so soon. I always remove them after their dead…brown, dry, really dead. You appear to cut the blooms before they’re even shriveling. Why is that? Aren’t the blooms what you want? Thanks for stopping. I dead head the blooms as they begin to fade or soon there after. This keeps the shrub looking nice and also invigorates the rose bush and places it in “GROW:” mode to produce more blooms for you…. I live in a very warm climate (zone 8a, in Central Alabama) and we see blooms from early April until November but using this method. Great blog post, Chris! I’ve learned so much from you! Thank you for showing straight forward with pictures….I was getting frustrated with all the reading and their being too wordy and not getting to the point…like how far and how much and how when…that’s what I like to know…it’s frustrating to get a history lesson and not straight forward instructions….Thank you sooooo much! I agree. I have also used this method in a pinch. Chis has good ideas here to encourage that fall flush of roses. So happy to be able to help! Fascinating! I never knew how pruning the roses was done. Thanks Chris – while I’d rather go chase an aging rock band in a VW bus, I will get out my pruners and trash can lid! I really appreciate the pictures in your description. So glad to help. Happy Gardening! Great information! My roses thank you from the garden! Great info. In PA, my roses are struggling. Terrible winter, wet rainy spring, & now humidity & BUGS! Thanks for stopping by. Bless your heart, the Polar Vortex took its toll on our garden too. Lost 10 roses and many others debilitated. 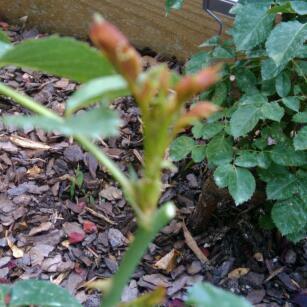 We press on on the hope of some good blooms and better weather conditions…. Please do! Sometimes the best of neighbors need a little nudge! Nice How-To Chris. I always enjoy seeing what you’re up to in that garden of Eden of yours. Warm regards, from the cooler Pacific Northwest! Awww, Shucks…… Eden? Ha…. It my own little piece of heaven….. It’s done got hot here in Alabama. Enjoy the cool temps…. Very good explanation about dead-heading! We all want as many roses as possible in the garden! Thanks for visiting my blog and thanks for the kind words. 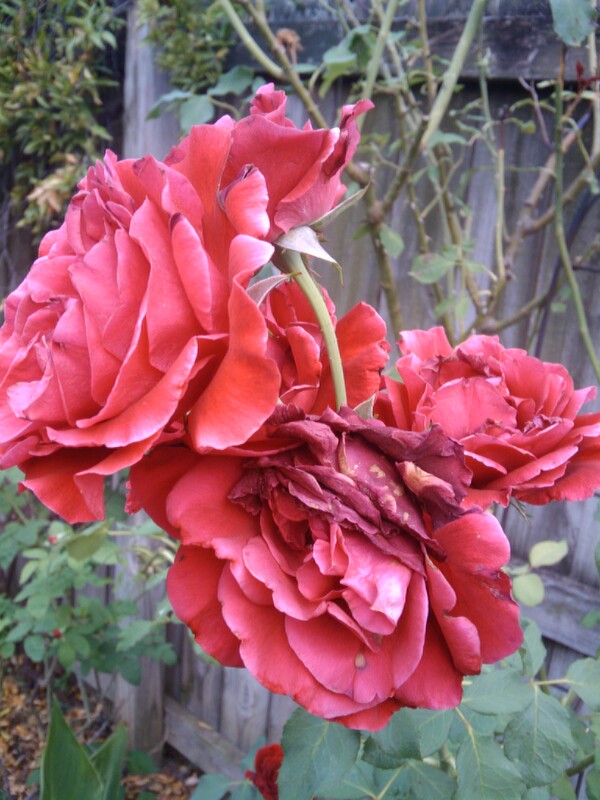 Deadheading is a great way to keep those roses in blooms! There is nothing that will make you more efficient in dead-heading your roses than The Gardener’s Hollow Leg, the debris and harvesting bag that you wear. It’s a five-gallon fabric sack with an adjustable belt attached. Great capacity, incredible efficiency! Chris, your pictures are so helpful! I sometimes cut at a three leaf, is this wrong? Not wrong, it will just likely produce a new bloom on a weakened stem. The further down the stem you go the thicker the cane will be. Thank you for such a great explaination and the pictures. This was very helpful. Would be glad to try to identity it for you. Just send me a picture. Very helpful, it’s nice to have pictures attached to the directions for beginners such as myself!